The FBI is Corrupt? Say It Isn’t So! Charges of corruption within the FBI has been in the news ever since the breaking of the Clinton email scandal. Whether you believe the charges or not likely has more to do with your personal political views than with any facts. And what are the facts? That’s an excellent question. News misreported, ignored, fake or real makes us each an investigative reporter ourselves to understand what is truth. To most of us, truth has no agenda. The truth is the truth and the chips fall where they may. Sometimes in a case, the evidence may be unknown or unavailable, and in those instances, we can look at a pattern of behavior - the history. Before we look at the beginnings of The Bureau, we should look at the document that theoretically defines the FBI. After all, the FBI should be an agency that exists to protect liberty and punish those who would infringe on our liberties. This is unfortunately where we find our first problem. Looking at the Enumerated Powers of the Legislature in Article I, Section 8; of the Executive in Article II, Section 2; and the Judiciary in Article III, Section 2 we cannot find any authority for an agency such as this. Our republic operated without a Justice Department for nearly 100 years. The department was formed with good intentions during Reconstruction to protect the rights of blacks, and crippling the Ku Klux Klan. Thirty-eight years later, The Bureau was formed during the progressive era in 1908, again for a noble cause. President Teddy Roosevelt established The Bureau of Investigation by executive mandate. Stanley Finch was named as the Chief Examiner to run the bureau. Roosevelt believed in a federal solution to problems, he did not recognize that failure to follow the constitution would lead to larger problems than the ones he thought he could solve. Initially, the Bureau was to help enforce anti-monopoly and interstate commerce laws looking through corporate financial records and the Justice Dept would prosecute. Roosevelt gave the bureau the mission of regulating the abuses of corporate capitalism. In time, the bureau and its directors would assume more and more responsibilities and gain more independence. When dealing with people, the odds are that corruption and abuse of power will result in the numbers and power increase. While our Founders designed a system based on self-restraint and personal responsibility, the progressive thought is that men cannot govern themselves, they must be ruled or controlled by an authority, a master. And if we allow ourselves to follow baser instincts rather than Godly principles then we give up liberty for security, and in the end, have neither. We can be abused by people who abuse our liberty or abuse their power. It’s not a perfect world. In 1910, Congress passed The White Slave Traffic Act, a law that banned the transportation of women across states lines for “immoral purposes”. The Bureau now added an investigation into prostitution rings, and some agents including Chief Examiner Finch used the law and their position to promote their ideas of morality. Finch believed prostitution to be evil and made its prosecution a top priority. The purpose of the Act was to stop and prevent women being held and forced into prostitution, Finch wanted to control the behavior. Congress delivered more power to The Bureau with the passage of The Motor Vehicle Theft Act in 1919. Most agents were still behind desks looking through corporate documents looking for abuses, but now there was a need for more agents in the field. Field offices began to appear, both in response to the prostitution and to go after criminals running stolen cars across state lines. WWI brought more power and responsibilities, the threat of espionage and sabotage placed the Bureau in charge of domestic security. The Bureau had a wide-ranging independence as it enforced new laws governing the draft, immigration, espionage, and sedition. By this time the head of the Bureau was A. Bruce Bielaski, a former underling of Finch. A congressional investigation of enforcement of the Selective Service Act uncovered violations of the 4th Amendment as men were rounded up and held until they could prove they had indeed registered for the draft. Bielaski was forced to resign in 1919 for his handling of the raids and detainments. The first man to hold the title of “Director” of the Bureau was William J. Burns. Burns was leading the agency when the largest scandal in the history of the nation occurred, the Teapot Dome scandal. Interior Secretary Albert Fall gave out a lease for oil reserves in Wyoming in return for kickbacks. 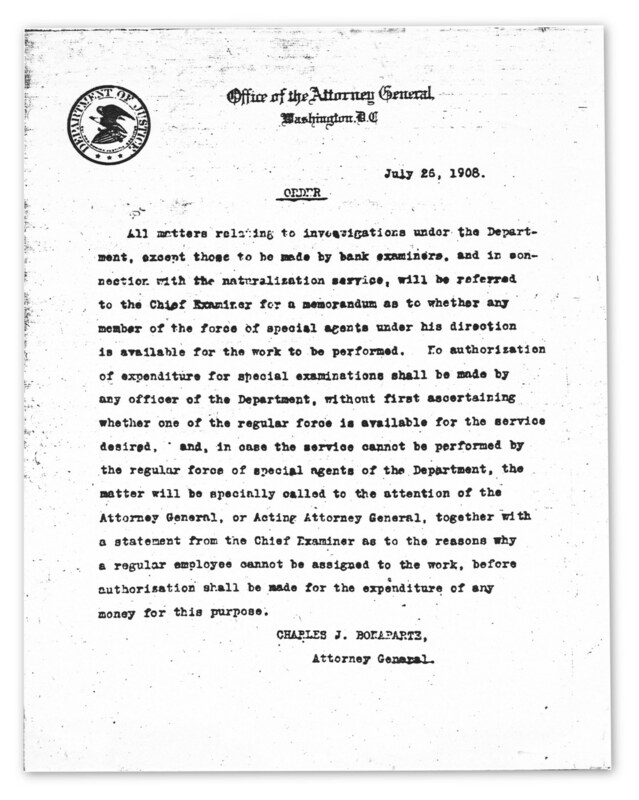 Senators Burton K. Wheeler and Thomas Walsh from Montana began an investigation into the shady deal and in response A.G. Harry Daugherty tasked Director Burns with ending the probe underway by the Senate. Initially, the Justice Dept was asked to investigate- however, Daugherty sidelined the effort. Burns owned a private detective agency so he used his own detectives, with help from Bureau detectives and Asst Director J. Edgar Hoover, to try and dig up dirt on the Senators and obstruct the investigation. After looking through their offices at night (without warrants) and failing to find anything incriminating, baseless charges of corruption were made against the Senators. Acquitted of the charges, Wheeler pressed on with his investigation. Ultimately A.G Daugherty was fired in 1924 and his replacement forced the resignation of Burns. The new Bureau Director, J.Edgar Hoover. Hoover Was Director until his death in 1972, serving in that capacity for 48 years. Under Hoover, the agency added “Federal” to its name in 1935 and grew from a relatively small investigative agency to a large law enforcement agency. The agency assumed arrest powers and began to use scientific techniques as they began to target the gangsters of the 1930s. The 18th Amendment brought prohibition and related crime which helped the “need” for more and more federal law enforcement. FDR also shifted more emphasis to national security and investigation of intelligence concerns. Intelligence gathering had always been a prime focus of the FBI and under Hoover, this took on an ominous tone. Hoover and the agency became well known for their political intelligence gathering; including investigations on obscenities, Hoover’s secret files, the targeting of war protestors, “leftists”, gays and blacks. The agency seemed to take on a modus operandi that the ends justify the means. As time passed, it seems they felt the Constitution was not a protection of the states and the people, but a protection of the government. The FBI was suffering from the public revelations of Hoover’s FBI. Efforts were made to try and repair the damage caused by Hoover and his diligence to investigate perceived problems. Shortly before Watergate broke, Nixon named a “yes-man”, L. Patrick Gray to replace Hoover. Gray’s tenure was short and he resigned in May 1973 after admitting the destruction of files related to Watergate. In an effort to prevent directors from being puppets of presidents and the Justice Dept, Congress mandated that directors should serve a statutory 10-year term. Under Reagan, William Sessions became director in 1987 and turned much of the agency’s focus to white-collar crime. Sessions became the first director to be fired while on the job. Fired by Bill Clinton in July 1993, an internal investigation revealed Sessions violated federal law regarding personal travel and home improvements using Agency resources. This brings us to James Comey, the second director to be fired. The internal investigation is still ongoing, the Inspector General is still looking at the evidence regarding how the Clinton email investigation was handled as well as the Russian involvement in the 2016 election. There are many unanswered questions and given the history of the agency, I personally do not have a warm fuzzy feeling that the FBI actions have been on the “up and up”. We have a federal agency with incredible power, one that was begun by presidential fiat and over the years has assumed greater and greater power. Perhaps we are looking at the wrong thing as this mess unfolds. We must not ignore the “Long train of abuses and usurpations”. To me, the question is not about what the FBI knew and when did it know it, But rather, why an unconstitutional agency is allowed to continue to exist at all. I’m not saying we don’t need something like the FBI, however, there should be an amendment to the Constitution giving the authority and limitations of its power.